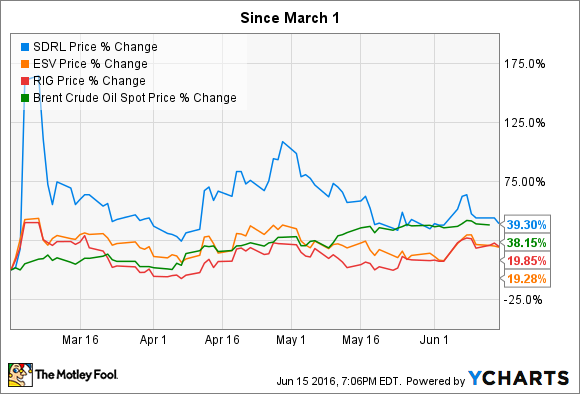 Oil prices are up, and so are offshore drilling stocks Seadrill Ltd, Transocean LTD, and ENSCO PLC. But despite the good news, it's too early to call this a recovery in offshore oil. Less offshore drilling activity remains a problem for these companies. Image source: Getty images. There's no denying that higher oil prices are good for the offshore industry. However, short-term increases won't translate to improved prospects for offshore drillers anytime soon. And that means it's probably not time to buy shares of these companies just yet. Here's why. Revenue and net income in millions. Backlog in billions. *Backlog data is from most recent prior sequential reporting period, not year-ago quarter. **Transocean net income is adjusted based on non-cash asset writedowns from 2015 quarter. Data source: company filings. As you can see, all three companies reported weaker financial performance across-the-board last quarter, which may seem obvious considering that first quarter oil prices were the lowest the world has seen in well over a decade. However, that wasn't the biggest driver behind the deteriorating performance for offshore drillers, but more of a symptom of the long-term impact of low prices: Oil producers aren't contracting for much new offshore work at all right now. One only has to look at the contracted backlogs reported by Seadrill, ENSCO, and Transocean last quarter to see this playing out. For well over a year now, contract backlogs at offshore drillers have gone backwards, as drillers continue to work through contracts they signed in prior years. Sure, there has been some new work awarded in recent months, as we saw from Seadrill's earnings report, but it's nowhere near enough to offset the work that gets completed each quarter. As things stand today, most oil companies that contract with offshore drillers are still focused on cutting capital spending, and that's likely to continue through the end of 2016 at the very least. So far, there's been zero evidence that $50 oil is changing any minds on that. To the contrary, a recent move by Statoil ASA shows how averse drillers are to spending on oil and gas field development today. Statoil still had Seadrill's West Hercules under contract through the end of the year, but instead of putting the vessel to work in the Aasta Hansteen gas field off the Canadian coast as it had been planning, the company instead chose to cancel the remaining term with Seadrill and pay the company $61 million. To not drill. Not only will Statoil save about $33 million to terminate the contract early, but it will also defer tens of millions of other costs related to starting up the Aasta Hansteen field at a later date. With oil and gas prices still far below historical levels, it's likely that more producers will follow suit, putting off expensive offshore development simply to make ends meet this year. There's no getting around the reality that the oil and gas reserves found offshore will be a necessary source of energy in the years and decades to come. But one only has to look at the boom and bust history of the industry to remember that it can be dangerous jumping into the wrong companies too quickly. Case in point? The 70-plus oil and gas producers which have filed for bankruptcy over the past year or so. Now I'm not predicting that Seadrill, ENSCO, or Transocean will end up bankrupt before the market recovers, but at things stand today, these companies are living on backlogs that won't last forever, and they all have substantial debt obligations that must be met as well. So what's an investor to do? For now, I plan to stay on the sidelines, looking for evidence that producers are coming back to the offshore oil patch, and ready to spend to develop those resources. When they do, I'll be a buyer. But before then, I'm not willing to risk any more cash on an offshore driller that doesn't make it through the downturn. And as things stand today, it's just too early to tell who the winners -- and losers -- are going to be.